China has deployed fighter jets to the same contested island in the South China Sea to which it also has sent surface-to-air missiles, US officials said on Tuesday. Citing two unnamed US officials, Fox News said US intelligence services had spotted Chinese Shenyang J-11 and Xian JH-7 warplanes on Woody Island in the disputed Paracel Islands chain over the past few days. Navy Captain Darryn James, a spokesman for US Pacific Command, confirmed the report but noted that Chinese fighter jets have previously used the island. Woody Island, which is also claimed by Taiwan and Vietnam, has had an operational airfield since the 1990s but it was upgraded last year to accommodate the J-11. "We are still concerned that the Chinese continue to put advanced arms systems on this disputed territory," James said. The move was reported as US Secretary of State John Kerry hosted his Chinese counterpart, Foreign Minister Wang Yi, in Washington. Last week, China confirmed it had placed "weapons" on Woody Island, defending what it said was its sovereign right to do so. Wang had been scheduled to visit the Pentagon earlier Tuesday but the visit was canceled due to a "scheduling conflict," officials said. 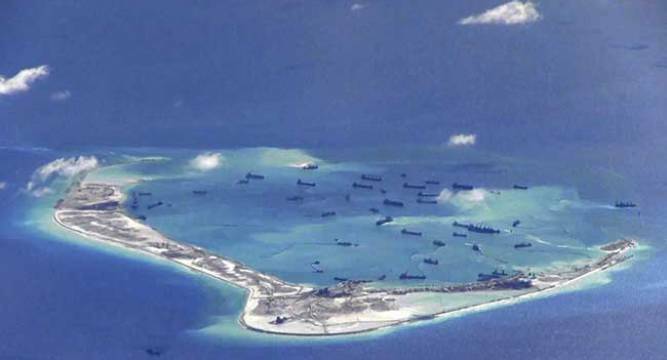 On Monday, the Washington-based Center for Strategic and International Studies released satellite imagery showing what appeared to be a high-frequency radar installation under construction on an artificial island on Cuarteron Reef in the Spratlys. China's land reclamation and military buildup in the South China Sea have drawn international condemnation and the United States has said it will continue to sail through waters claimed by Beijing.